In a stirring tribute to one of the greatest centers in NBA history, the Phoenix Suns, acquired Shaquille O’Neal yesterday from the Miami Heat for 1999 prices. Shaq-Fu, who has won 4 Championships over the course of his dominant career, was in the midst of his worst NBA season, averaging somewhere around 14 points per game and barely playing for the Heat, one of the NBA’s worst teams. 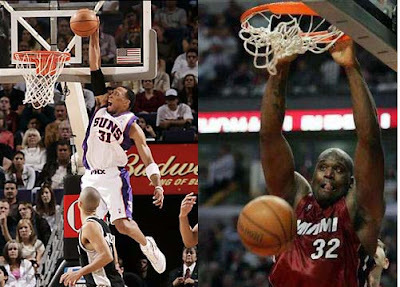 To get O’Neal, an old 36, the Suns gave up Shawn Marion, a 4-Time All Star who has averaged a double-double for the past 8 years, can guard just about any position, hit an open three, finish and start a fast break and who is just 30 years old. With the Suns, who are lead by slashing, run and gun stars such as Steve Nash and Amare Stoudemire, basically a running team- famous for their fast-paced offensive style, adding O’Neal- a 315 pound, 7’1 monster in the paint, makes a lot of sense- back in 1999.
true tribute. I don't know about you, but I have been pinning for a pre-quel to Kazzam for YEARS.